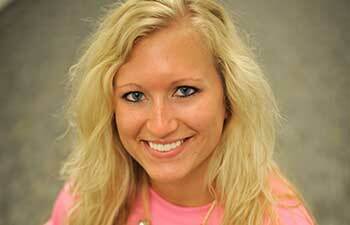 As a high school student growing up in Fennimore, Taylor was an avid athlete involved in cross country and track. Her senior year, she was even Captain for both sports. As many athletes do in their high school career, she attended physical therapy to help with an injury. At the time, she didn’t realize how big of an impact that would have on her future. When the time came to think about college, Taylor wanted to get out of Fennimore and experience life in a bigger city like La Crosse. Her brother had gone to school there and she heard of a great Physical Therapist Assistant program available. After further consideration, Taylor realized that her comfort zone was in Fennimore and she decided to learn more about the Physical Therapist Assistant program at Southwest Tech. Taylor is very pleased with her choice to attend Southwest Tech. Taylor plans to graduate in the spring of 2015 and hopes to get a job somewhere in the tri-state area as a PTA either in a nursing home or in pediatrics.